When my family used this book, we had difficulty understanding some of Tagliapietra’s explanations. Because the book lacks a clear system, it is sometimes hard to follow. 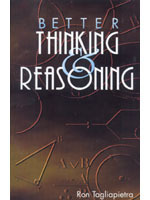 This book intermingles modern symbolic logic with informal logic. It does not cover categorical syllogisms. The practical and Biblical applications of logic were helpful, as were the exercises. I do believe other books do a better job teaching logic, though they are not as distinctly Christian as Tagliapietra.